People living near Alton Towers in Staffordshire are being asked to support the theme park in its fight to overturn a noise ban. 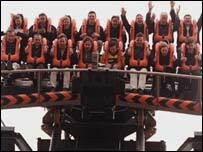 The owners of Alton Towers were served with a noise abatement notice and fined £5,000 in November 2004 after a court upheld complaints from a local couple. Stephen and Suzanne Roper brought a private prosecution against the park. A meeting will be held in Alton village next week as local businesses fear the ban could affect trade in the area. Mr and Mrs Roper, who live 100 yards from the Staffordshire theme park, had claimed ride noise and screaming made their lives a "nightmare". At the time they said other residents felt the same but were reluctant to raise objections. But Gina Dickerson who also lives near the park said a number of people were worried about the effect the abatement order will have on Alton Towers' business and on the local economy. She has organised the meeting for local people to show their support for the park next Wednesday at Alton Village Hall. Ms Dickerson said: "People are so worried and it is not just local businesses. "If we do not start showing support to Alton Towers they have already said they could end up moving from the area. Staffordshire cannot afford that." Tussauds Theme Parks, which owns Alton Towers, is to appeal against the abatement order in court next month.